Product prices and availability are accurate as of 2019-04-17 22:59:23 EDT and are subject to change. Any price and availability information displayed on http://www.amazon.com/ at the time of purchase will apply to the purchase of this product. As versatile as it is attractive, Brightech's Ava Pendant Floor Lamp pairs effectively with a variety of decorating styles: the lamp looks equally "at home" amid contemporary, mid-century modern, or industrial-influenced abodes. Its slender, stem rises smoothly into a circular, open-top drum shade. When you move the adjustable pendant arm, the shaded light moves, too, letting you re-cast where the soft, luminous light falls. The angling of the head means that you can place the lamp in the corner and still have its light reach outwards to the middle of your space. The stem's sleek black finish creates a glossy contrast to the textured fabric shade. A neutral linen hue that turns beige/burlap once illumined, the shade gives off a relaxing warm glow. The Ava has the profile of an expensive designer lamp, yet costs substantially less. And it's very simple and easy to use. You just tap on the built-in foot switch in the cord, and Voila! To adjust the head, just loosen the knob at the top of the stem to raise the arm higher or lower, then tighten the knob to anchor the shade back in place. 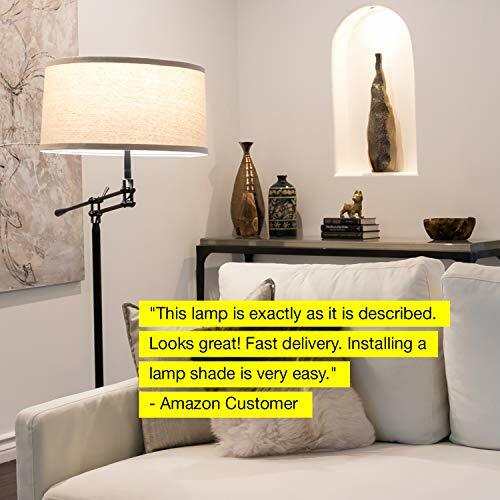 The Ava Floor Lamp includes Brightech's energy-saving, cool-to-the-touch LightPro LED bulb that will fit into the standard E26 medium base socket. Drawing a mere 9.5 watts, the long-lasting LED has every advantage over short-lived incandescent bulbs. LED won't fizzle and burnout, and it never makes a room uncomfortably warm. Best of all, LED doesn't guzzle power; using LED reduces your electricity bill over time. LightPro has 800 Lumens, a color temperature of 3,000 Kelvin, and 45,000 hours of soft, calming light. Easy to assemble within ten minutes, the Ava stands at about 4 feet and can be raised to 5 feet tall. The drum shade measures 9.5 inches tall by 18 inches wide. The heavily weighted base makes tipping over unlikely. Plug into 110-120V outlets only. 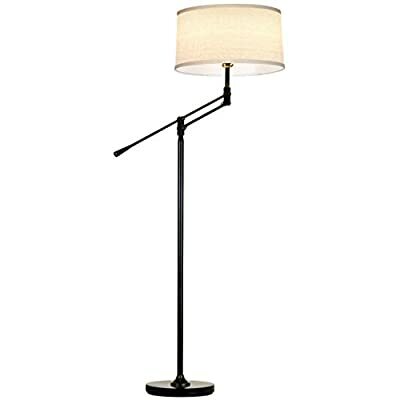 UNIQUE ADJUSTABLE PENDANT ARM: The Ava lamp has a height adjustable upper arm that allows you to adjust the height of this lamp up to a maximum of 5 feet tall. The arm has an outward reach of about 1 foot from the pole and the adjustable hinge allows the lampshade to be positioned to any height between 45 inches and 61 inches from the ground. The adjustability of this lamp allows you to position the light perfectly for reading, knitting, cross stitching and other hobbies. 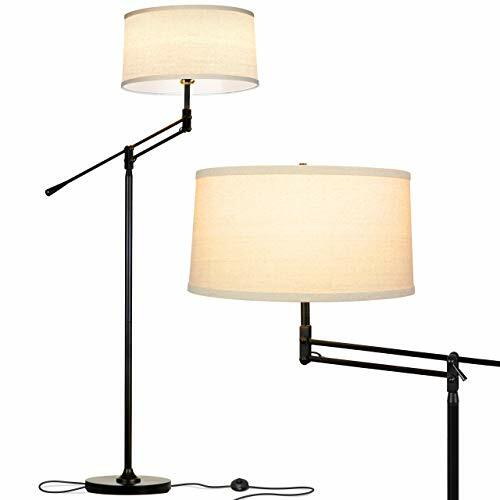 CLASSIC LAMP THAT LOOKS GREAT WITH ANY DÉCOR: This lamp has a trendy yet classic design and sits nicely amongst Traditional, Mid Century Modern, Industrial, Contemporary, Scandinavian, Minimalist, Urban, and Rustic Decor. The black finish on the metal stem and base pairs perfectly with the warm diffused light tone of the textural lampshade. The overall look and feel of this lamp will create a warm, cozy and inviting atmosphere in any space. (Note: Made for use with standard 110 v outlets.) 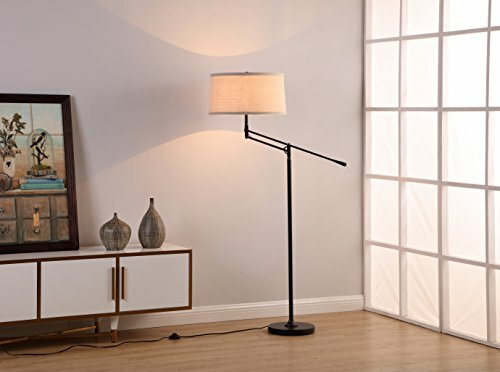 BEAUTIFUL WARM LIGHT FOR HOME & OFFICE: This Lamp gives off warm beautiful light that will create a cozy, comfortable, and well-lit space for any room in your home. An alternative to unpleasant overhead lights, the Ava provides soft yet plentiful room lighting to enlighten your indoor space. 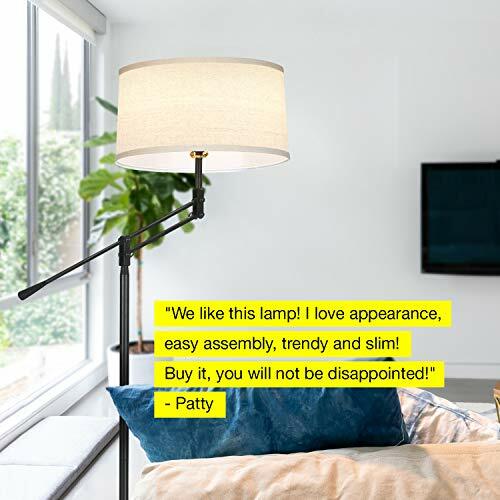 For added convenience, this lamp is smart outlet compatible with Alexa, Echo, Dot, Google Home, etc. and it is compatible with wall switches. The Ava is not dimmable or compatible with 3 way bulbs. LONG LASTING & ENERGY SAVING LAMP: This Lamp is UL certified and includes a 9.5 Watt power saving LED light bulb so that you never have to replace a bulb. It's advanced 3,000K warm white LED technology with 800 lumens allows this lamp to outshine lamps that depend on short lived, energy consuming standard halogen or incandescent bulbs. This LED lighting will endure for more than 20 years without burning out or overheating. 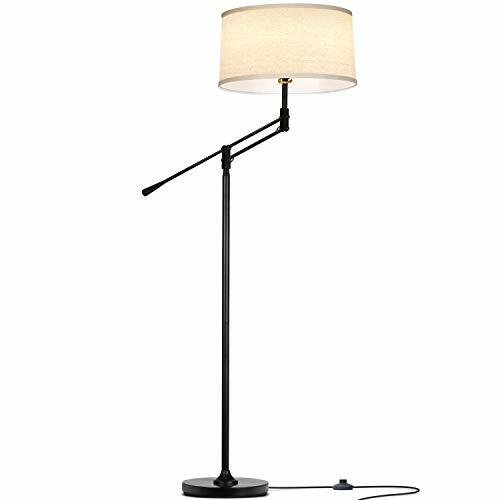 Save money and energy with the Ava LED Floor Lamp. Max Wattage 60 W CFL. SATISFACTION GUARANTEED WARRANTY: Our goal at Brightech is to provide creative, innovative, and beautiful lighting so that everyone can have quality, high end lighting in their home and office. We proudly stand behind all of our products 100%, which is why we offer a Full 3 Year Warranty. If for any reason you are not satisfied with your purchase, please contact us because our number one goal is customer satisfaction and we are committed to making it right for you.